As we went to press we heard the extremely sad news that David Bowie had tragically died after an 18-month battle with cancer, aged 69. Our February/March 2016 issue – now on the shelves – pays tribute to Bowie: innovator, superstar and supreme creative force. Also in this issue we celebrate 30 years of synthpop stalwarts Erasure – Andy Bell and Vince Clarke review their career together in our exclusive interview. Elsewhere, we chat to Gary Numan about his new crowd-funded album and how he has opened the studio doors to fans, we sit down with graphic designer Keith Breeden to discuss his exceptional work with Scritti Politti and we interview pop duo Hue & Cry about their Frank Sinatra tribute. Our ‘Labelled With Love’ profile returns with British Electric Foundation and a fascinating interview with founder Martyn Ware, Primal Scream’s iconic 1991 LP ‘Screamadelica’ gets the ‘Classic Album’ treatment and author Anthony Reynolds unlocks the making of Japan’s orchestral third album ‘Quiet Life’. PLUS! 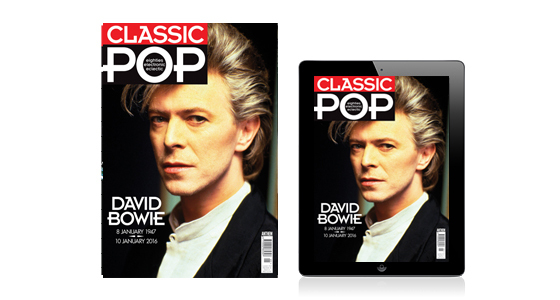 Do keep an eye out for our dedicated one-off David Bowie Classic Pop special edition – available very soon. @CrowleyOnAir @eelpierecords Beanos in Croydon - great staff and many hours spent scanning the racks. Three floors of heaven. Now sadly gone.